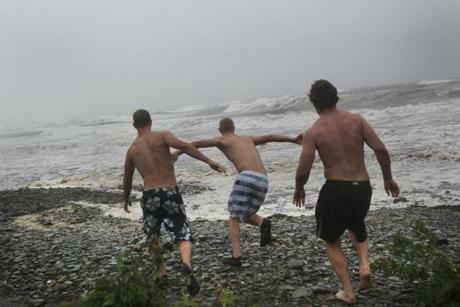 1st place Feature: Brains without Supervision: The not-so-calm-before-the-storm of Hurricane Sandy. 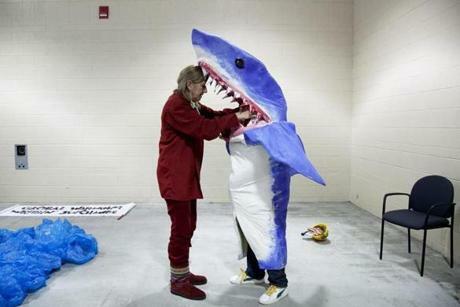 2nd Place Feature: Shark: New York artist Pat Oleszko helped Osmar Ramos-Caballero of Holyoke with his costume of a BP employee being eaten by a shark. Oleszko had a costume-themed "Global Warning! Writhin' See/Change" group for First Night. 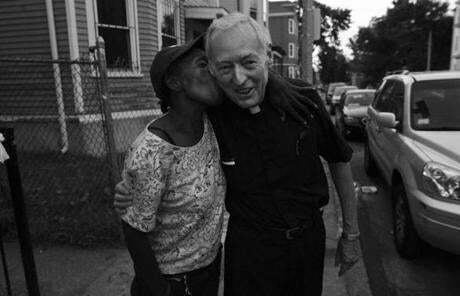 HM Feature: Surprise Kiss: Father "Doc" Conway of St. Peter Church received a kiss from Anette Haynes while walking through the Bowdoin-Geneva neighborhood. 2nd Place General News: Waiting for Caleigh: Lisa Harrison and brother-in-law Anthony Harrison waited at the Harrison home for word of Anthony's daughter, Caleigh. Two-year-old Caleigh disappeared on a beach and was believed to have been taken by the sea. 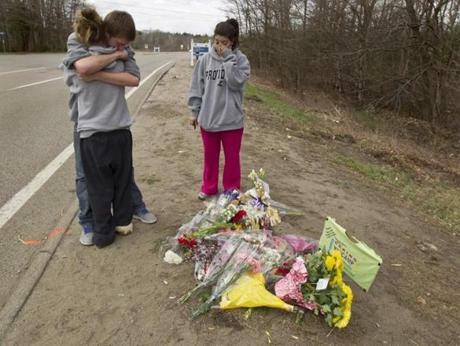 3rd Place Spot News: Forever Gone: Summer Anderson, 16, hugged friend Jason Beausolei, 16, as D'Angela Alberty looked on after the fatal car crash that took the life of Michaela Smith on the corner of Route 140 and Walnut Street in Foxborough. 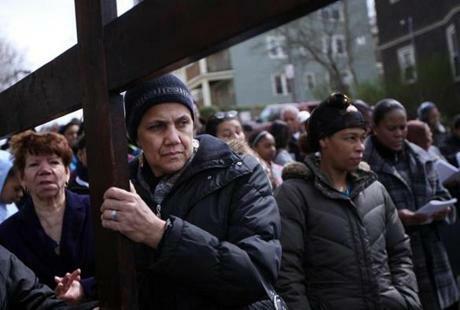 HM General News: Stations of the Cross: Marlene Texeira of Dorchester and parishioners from St. Peter Parish performed the Stations of the Cross ritual on Good Friday in the Bowdoin-Geneva neighborhood. 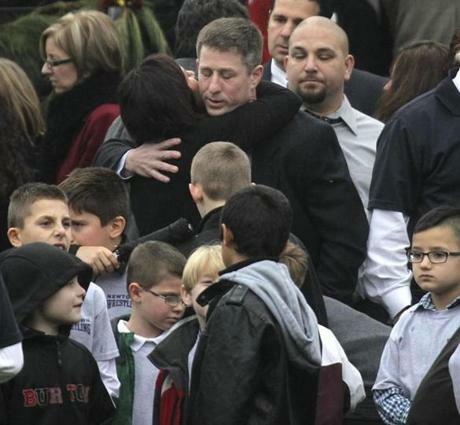 HM General News: Newtown: Mourners grieved outside of Honan Funeral Home on Main Street, Newtown. 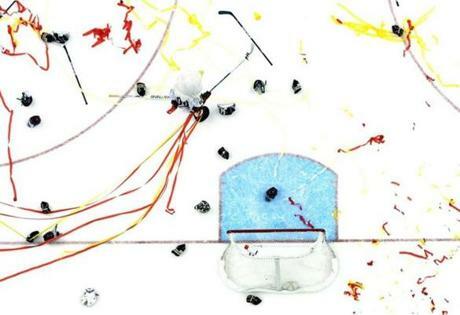 1st Place Pictorial: The Eagle has Landed: The Boston College Eagle mascot skated among the celebratory debris after BC defeated Ferris State 4-1 to win the 2012 Men's Frozen Four National Championship. 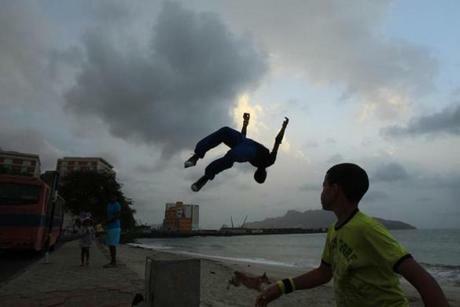 2nd Place Pictorial: Untitled: Young men practice parkour moves off a beachfront wall in Cape Verde. 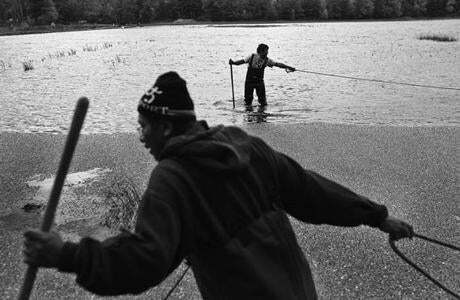 HM Pictorial: Cranberry Bog: At the Carlisle Cranberry Bog, high winds helped blow the cranberries toward the shore, making the job a bit easier for Francisco Guttierrez and Cristobal Lopez. 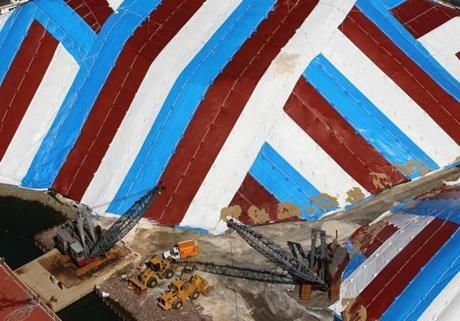 HM Pictorial: Stripes: Salt piles under cover in red, white and blue tarps in Chelsea by the waterfront dwarf cranes and bulldozers which were hardly used last winter because of the unusual warmth. 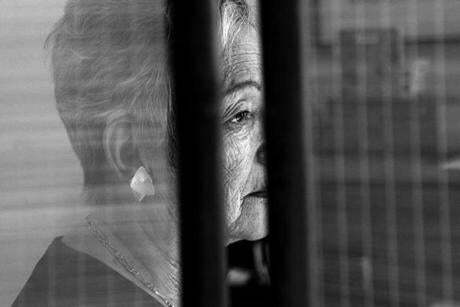 1st Place Portrait Personality: The Writer: Prize-winning writer Edith Pearlman was photographed at her home. HM Portrait Personality: Fashion Designer: Fashion icon Marilyn Riseman at a show of her dresses at the Boston Design Center. 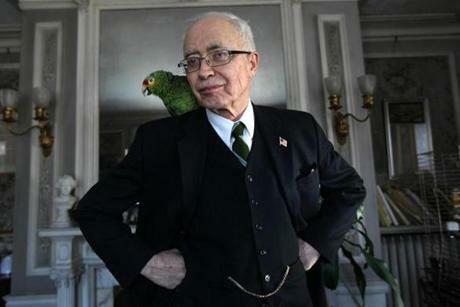 HM Portrait Personality: John and Tosca: John Lorimer Worden III at his home in Arlington with his parrot Tosca. 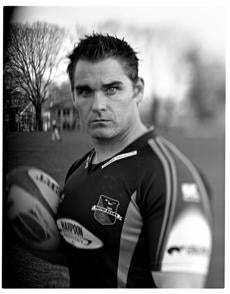 3rd Place Portrait Personality: Brendan: Brendan Ridge, of the Boston Rugby Club in Watertown. 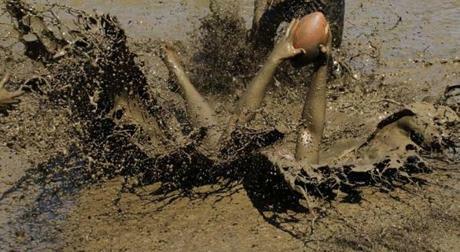 1st Place Sports Action: Intercepted: Jamie Sawler caught an interception in the annual Mud Bowl, a mud football tournament in North Conway, N.H.
HM Sports Feature: Untitled: Doc Rivers and Kevin Garnett on the sidelines during the Heat-Celtics NBA playoffs in 2012. 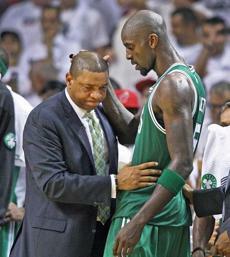 The Celtics lost the series to the Heat. 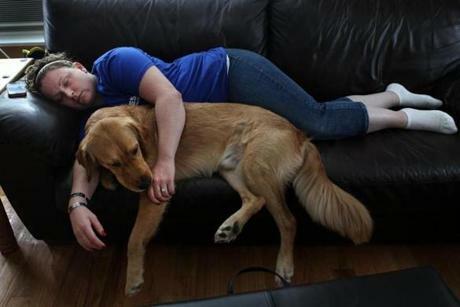 2nd Place Animal: Kaplan Family Hospice House is a 20 bed facility run by Hospice of the North Shore & Greater Boston. 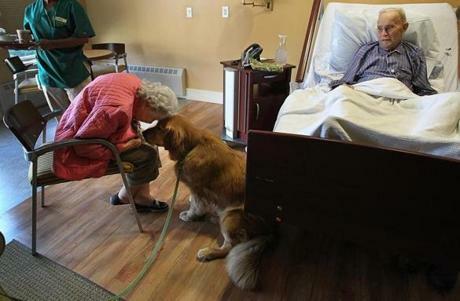 The house provides end-of-life care, along with grief resources, for families. 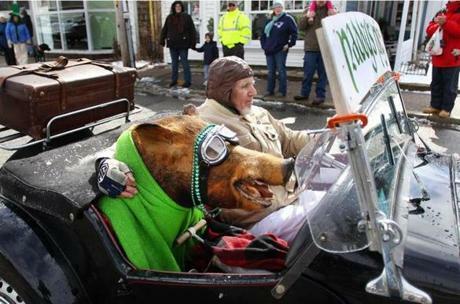 3rd Place Animal: Seamus Healy drove in the annual St. Patrick's Day parade. 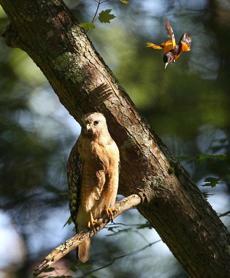 HM Animal: A hawk sat on a branch above a pond as an oriole fluttered above. 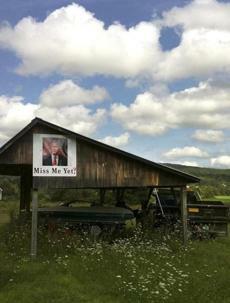 A picture of former President George Bush hung along a country road in rural Vermont.